Tuke School in the London Borough of Southwark is an £8.2m Special Educational Needs School and provides a ‘sensory school’ facility for students with the most severe Multiple Learning Difficulties and Autistic Spectrum Conditions. External cladding surfaces extend into the interior to create distinct zones and to assist the students with orientation. The M&E designs are unusual as ‘ground heating’ has been installed below ground in the footings through which air is passed to gain a warming effect in winter and a cooling effect in summer. This air is drawn into the building from an external vent and along the 60mm and 120mm air pipes shown by the construction site photographer by a low velocity fan. Ground air heating is often combined with ground source underfloor heating using geothermal underground heat. 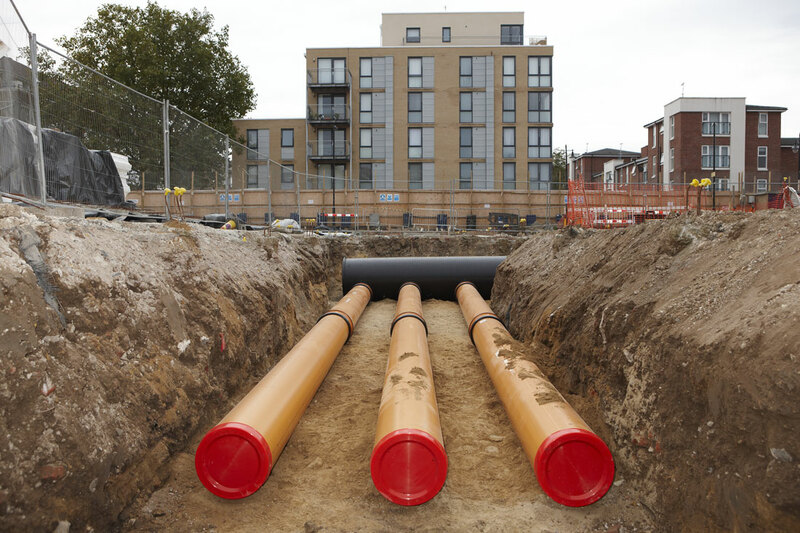 Air pipe is installed between two and three metres below ground and warms the air passing through it using the ambient 10 degree underground temperature at this depth. This underground installation is used to regulate temperature within the structure providing a cooling effect during the summer and warming benefit during the winter period. This system is often used with other green warming/cooling technologies in place of conventional air conditioning systems.